Google I/O is just hours away now and a lot of exciting new stuff is expected to be announced today, including a new version of Android. Now you can expect one more thing to be announced today, and that is Android TV. 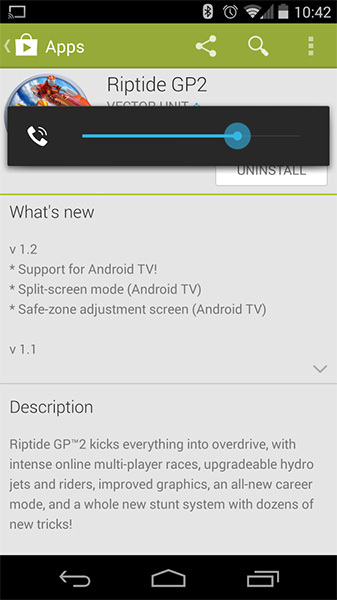 Game developer Vector Unit recently updated the changelog for their game Riptide GP2 and inadvertently mentioned support for the upcoming Android TV. The changelog has since been reverted but not without giving some information about the Android TV. Well, one thing we know now for sure is that it will definitely support games, so we are looking at something more like Amazon Fire TV than the Apple TV. There will also be a split-screen mode support in the game, likely for two player mode. Rest of the functionality, we believe, would be similar to the Chromecast but in a bigger package. We'll find out for sure in about ten hours from now. I would expect an update to chromecast that will support all the above functionalities. Google hope you will think greater than others.